❶ The best 50th birthday flowers. Order flowers online same day delivery. The best 50th birthday flowers. Order flowers online same day delivery. Congratulate your dearest and relatives on the anniversary, sending 50thbirthdayflowers. Order flowers online same day delivery in Riga (Latvia), or simply call the operator of KROKUS studio by phone +371 200 303 06. You can apply at any time of the day or night, as well as on weekends and holidays! To order birthday flowers is easy: only 5-10 minutes and a few clicks. Birthday flowers for her or for him will be delivered directly to the home of the gifted person within 2-3 hours. The Internet shop of fresh flowers and luxurious designer's arrangements KROKUS is glad to welcome its customers on the pages of its official website. Here you will find a wide choice of bouquets for any holiday, for example, name-day celebration, birthday, anniversary. Often the customers ask: where to find an arrangement of 50th birthday flowers to send it to the address in Riga or another city in Latvia? We are ready to help you to choose the best bouquet, which it is possible to deliver to the jubilee even without leaving home. Birthday flowers in Riga are available for order at a super price! Besides the traditional plants, you can also find meadow and wild flowers and order flowers online same day delivery in Riga. One of the most impressive offers of our shop is the order of onlineflowersandgifts for the 50th anniversary in Latvia. It is possible to complement any of the presented bouquets with a bottle of elite alcohol, a box of chocolates, a fruit basket, a souvenir. Often the customers from Riga and other cities of Latvia order birthday flowers online in the form of an amazing festive cake, supplemented with real candles to organize an amazing surprise for the jubilee. Be sure, such a present will leave the warmest impressions of any birthday person. 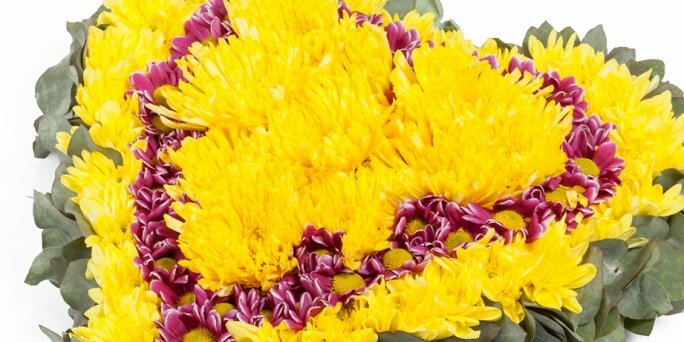 You will find magnificent flowers online in Riga in our catalog! How to order birthday flowers with the delivery in Riga (Latvia)? Do you want to please your mother, grandmother, colleague, girlfriend or just a friend with a 50-year anniversary? Then order birthday flowers for her in one of the best online shops in Riga and Latvia - KROKUS. You can do this using a convenient form of buying a bouquet directly on our website or simply by calling the company manager at the specified phone number. Besides, after contacting a specialist of KROKUS, you will receive a free consultation on the choice of an arrangement, as well as the help in ordering.